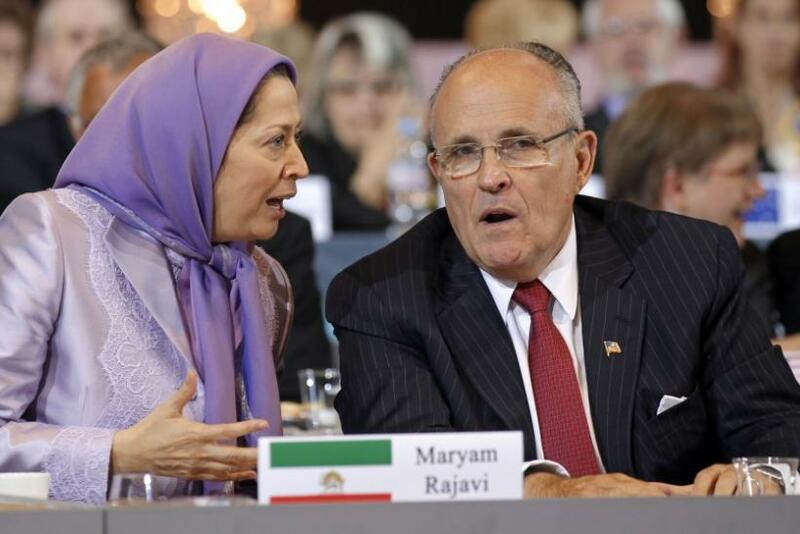 Undeterred by a federal investigation into the activities of some of his peers, former New York Mayor Rudolph Giuliani has shown unwavering support for an Iranian dissident group called the People's Mujahedin of Iran, also known as the Mujahedin-e Khalq or MEK. Giuliani -- along with former U.S. Attorney General Michael Mukasey, former Homeland Security chief Tom Ridge, former U.S. Ambassador to the United Nations John Bolton and former Rhode Island Rep. Patrick Kennedy -- spoke at a conference in Paris on Monday, where he suggested that the United States should use the People's Mujahedin to militarily attack Iran's nuclear program. I have a feeling that the only thing that will stop [Ayatollah Ali Khamenei] and the only thing that will stop [President Mahmoud] Ahmadinejad is if they see strength, if they see power, if they see determination, if they see an America that is willing to support the people that want to overthrow the regime of Iran, Giuliani told the audience in Paris. But the MEK -- along with 49 other groups including al-Qaeda and Hezbollah -- is officially listed on the State Department's list of Foreign Terrorist Organizations, a distinction that means that providing material support or resources or accepting donations or contributions for it is illegal. Three top-rank former U.S. officials are currently being investigated by the Treasury Department for accepting speaking fees from the MEK. Former Pennsylvania Gov., Philadelphia Mayor and Democratic National Chairman Ed Rendell was the first to face federal scrutiny for accepting speaking fees from the MEK, and earlier this month ex-FBI Director Louis Freeh and a former chairman of the Joint Chiefs of Staff, retired Gen. Hugh Shelton, were also subpoenaed. Giuliani blasted the cowardly sources in the State Department or elsewhere who unknowingly are doing the bidding of the mullahs, adding that the potential criminal repercussions don't frighten me, won't stop me, won't stop any of us, ever. Giuliani, who charges as much as $100,000 per speaking engagement, was asked to appear at the Paris conference by the French Committee for a Democratic Iran. The U.S. Treasury Department charges that these types of Iranian organizations are clandestinely funneling money from the MEK into speakers' pockets. Groups like the Iranian American Community of North Texas and the Iranian American Cultural Association of Missouri have paid hundreds of thousands of dollars to American officials as well. This is an utter lie and there is not even a scintilla of truth to it, stated MEK spokesman Hossein Abedini, in a statement, responding to the allegations. The MEK, as the legitimate opposition to the clerical regime, enjoys international recognition in Europe and the U.S. The objective of this failed propaganda is to weaken the widespread public support of the members of Congress, officials and scores of U.S. generals for ... revoking of the illegitimate and unjust terror listing of the MEK. Rendell was implicated because he allegedly accepted fees from the National Council of Resistance of Iran, or NCRI, a political organization that is believed to be a front or alias for the MEK. The NCRI's homepage is littered with photos of American officials, such as Giuliani and Ridge, and its ties with the MEK are no secret. Headed by Iranian exile Maryam Rajavi, the NCRI is the umbrella organization of five Iranian opposition groups that the State Department states is not a separate organization, but is instead, and has been, an integral part of the MEK at all relevant times. As the Iranian nuclear confrontation intensifies, the furor surrounding the MEK is only going to increase. The group is trying to position itself as a friend of the U.S. and Israel, one devoted to overthrowing the Islamic regime in Iran, but its history works against such claims. The MEK found itself on the terrorist list after attacks on Americans and the American-backed Shah in the 1970s and 1980s. After falling out with Iran's revolutionary leaders, the MEK found an ally in Saddam Hussein, who paid for the group's military expertise during his bloody 1980-88 war with Iran. However, the MEK now claims to be a peaceful, democratic organization. Its members currently live as refugees in Iraq's Camp Ashraf, where some feel that MEK has morphed from terrorist group to cult. Since 1985 the MEK has changed into a destructive cult, said Masoud Banisadr, its former U.S. spokesman. To be a cult means, they always pursue their own specific interest. They might be useful (to the U.S.) in one occasion or another, but as a whole as they are not loyal toward any norms, ethics, principles or mutual agreement. Like al Qaeda, they cannot be trusted. Regardless, the U.S. State Department said on Monday that it continually reviews the status of the MEK on the Foreign Terrorists list. In the meantime, people like Giuliani will continue to fight for a group that is as polarizing in the international community as the ongoing discussion about a pre-emptive military strike on Iran. Are Israel, US Secretly Paying Terrorists To Destabilize Iran?